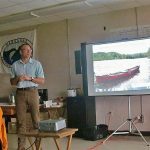 The Margaree Salmon Association's 2018 AGM Minutes are now available for download. 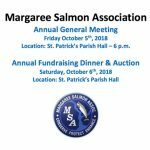 The MSA will be holding its AGM on Friday, October 5th, 2018 and its Annual Dinner Auction on Saturday, October 6th, 2018. Both will be held at the St. Patrick's Parish Hall. By-Law draft containing proposed changes now available for download. The Spring 2018 Newsletter is now available! The EXP River Management Report is now available for download. Ron Jenkins, Senior Project Manager, Matrix Solutions Inc. presents the much-anticipated report, “The Geomorphic Assessment of the Margaree River”, at the MSA offices at Cranton Crossroads Community Centre. Report available for download. The Fall 2017 Newsletter is now available! 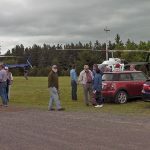 Northeast Margaree, NS - Port Hawkesbury Paper, LP (PHP) representatives came to Margaree on July 24, 2017 at the request of the Margaree Salmon Association (MSA). The MSA's annual general meeting is scheduled for October 6th at 7PM, held at the St. Patrick’s Parish Hall.